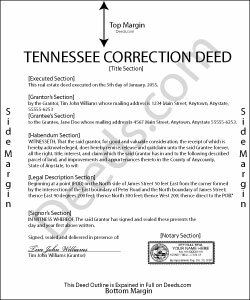 Use the correction deed to correct errors in a warranty, special warranty, or quitclaim deed in Tennessee. The best option for correcting a deed in Tennessee is to record a correction deed. Other options, such as a scrivener's affidavit and re-recording the original deed, both have some drawbacks. The scrivener's affidavit can serve as a valid alternative when the original grantor is not available. Tennessee law provides that a corrected copy of the original document may be attached to the affidavit as an exhibit (T.C.A. 66-24-101(a)(27)). Such a copy, however, only carries the weight of an exhibit to an affidavit and not that of a recorded document. Re-recording the original deed with corrections requires a new execution/signing and notary acknowledgement. The reason for correcting, the actual correction and cross-reference to the prior recording must be made on the existing copy or, depending on county requirements, on a title page. This will not only require fees for the additional page(s) when re-recording, but also creates potential problems during the recording if the added information does not stay within the required document margins. The easiest and cleanest option for correcting a deed is to record a new correction deed, which makes reference to the original document by date and recording number and gives the reason for the correction by indicating the type of error. Except for the corrected or omitted information, it duplicates the text of the prior deed. The original parties must sign in the presence of a notary, who then acknowledges this new instrument prior to recording. In some Tennessee counties, a corrective deed must have a new oath of value, if the original deed is more than 6 months old. Reply from Staff: Thank you Kerry, have an awesome day! Carole L. said: Perfectly easy, perfectly complete! I had no problems with downloading these forms. I have been a paralegal for 20 years and came up on a situation where I was not familiar with the forms. Deeds.com saved my life and allowed me to get the documents done and done right. I will keep deeds.com on my list of favorites! Reply from Staff: Thank you Carole. Glad we could help. We appreciate you taking the time to leave your review. Reply from Staff: Thank you Mary. We appreciate your enthusiasm, have a great day! Pam B. said: This form really helped me out a lot could be a little more explanatory in some areas but all and all it works. Reply from Staff: Thanks Pam, we appreciate your feedback. Sandra S. said: Very helpful, with blank and sample completed documents. The only thing I was confused about was the "legal description" of my property. The documents weren't too helpful on what that meant. Otherwise they were great. It saved me $200 to prepare these myself.